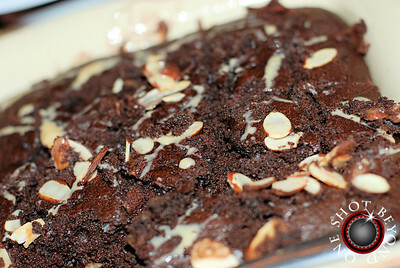 With fall and winter days ahead one just wants to be served a big helping of warm & fresh brownies! Am I right??! ~ by oneshotbeyond on October 14, 2008. Are those slivered almonds on top? And, tell us about the creamy white liquid that is adding to the moistness of the tasty looking treat. You have GOT to start sharing recipes along with the pics!!! minus the nutty parts I am jonesing for a bite of that! the DOF looks very cool on this!